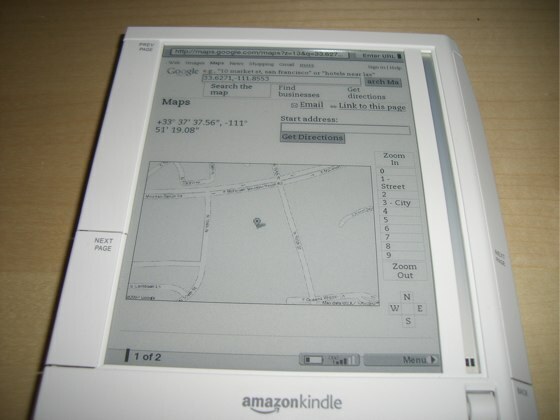 Amazon’s Kindle ebook reader an has unpublicized feature: it can tell you where you are via Google Maps and mobile phone based location finding. Discovered by Interface, the feature uses the Kindle’s built in CDMA mobile coverage to triangulate your location on Google Maps, delivering a similar experience to a GPS unit, complete with the ability to locate nearby gas stations and restaurants. Other hidden features in the Kindle include a hidden picture viewer, support for screenshots and even Minesweeper. For those who have already purchased a Kindle, these hidden features are an added bonus, but are unlikely to create new demand for the device, after all it still doesn’t offer color and is a touch big to be mounted on a car dashboard for directions. GPS units have also come down a long way in the last two years, I purchased one as a gift for someone this year for $130; sure, it doesn’t read books but it looked prettier and I’m betting is easier to use.